At a time when so much of the world has been touched and affected by man, outdoor enthusiasts are all searching for pure, pristine locations to witness the true beauty of Mother Nature in all her splendor. Much of California has been changed or altered by mankind in one way or another over the years, but Tomales Bay is one of the purest locations the state has to offer. The biggest unspoiled coastal bay in all of California, Tomales Bay is a very special place. Countless outdoor and nature enthusiasts have fallen in love with this location time and time again over the years and it is easily one of the top must-visit locations in all of California, especially for people who want to enjoy fun ecotourism activities like kayaking. Running for 15 miles and covering over 6,700 acres of land, Tomales Bay is located in Marin County, California. Part of the Point Reyes National Seashore, the area is dotted with just a few small communities: Point Reyes Station, Marshall, and Inverness. 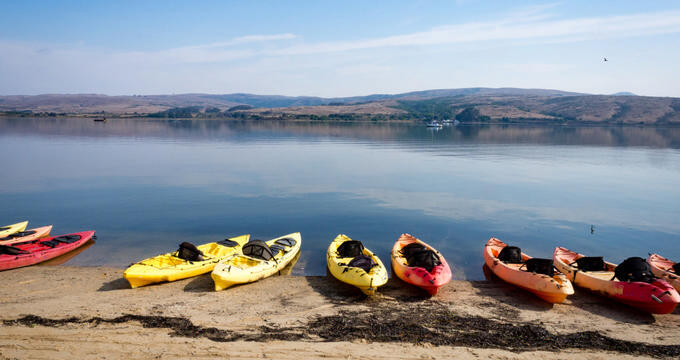 Camping and kayaking are hugely popular activities in this area all year long, with Tomales Bay also being well known for its oysters and bioluminescence, which can be observed from June through to November. The rocky shores and absolutely stunning natural scenery in this area will take your breath away, and the very best way to enjoy Tomales Bay is by kayak. As kayaking has become such a popular activity at Tomales Bay, a couple of kayak rental and tour services have opened up around the area. These kayak companies provide low cost rentals and guided tours around the waters of the bay. Staffed by friendly kayaking and outdoor experts, these kayaking operators can provide you with all the information and equipment you need to make the most of your Tomales Bay kayaking adventure, and they’re happy to welcome guests of all ages and ability levels. Here are some details on the kayaking tours and rental services you can enjoy at Tomales Bay. The oldest and therefore most experienced kayaking outfitter in the Tomales Bay area, Blue Waters Kayaking is conveniently located in the small bayside community of Inverness. Offering kayak tours and rentals of the waters of Tomales Bay and nearby Lake Sonoma, this kayaking company goes to great lengths to ensure that every kayaker has a super time and makes memories they'll never forget at Tomales Bay. Low cost rentals are available for both single and double kayaks, and you can choose to rent for a wide variety of time periods from as short as two hours to as long as two days. Stand up paddleboard rentals are also available and Blue Waters Kayaking uses only the best equipment. Meanwhile, if it's a guided kayaking tour you're looking for, Blue Waters Kayaking has got a lot of options for you. This company runs all kinds of kayaking tours, including unique specialized tours involving yoga and camping too. Wetlands tours, exploration tours, oyster tours, birdwatching tours, and bioluminescence kayaking tours can all be enjoyed at various times of the year. In short, no matter what kind of Tomales Bay kayaking experience you’re looking for, Blue Waters Kayaking will be able to meet your needs. Located at Point Reyes, this company is almost exclusively focused on kayaking. They do provide some stand up paddleboard rentals and services too, as well as organizing hiking and backpacking tours, but the friendly folks at Point Reyes Outdoors are mostly kayak experts and enthusiasts and offer a huge range of kayaking tours and experiences. From June through to November, guests can enjoy bioluminescence kayaking tours as the sun starts to set, with half-day and full-day kayak paddling tours also available throughout the year. The experienced kayaking guides at Point Reyes Outdoors know every nook and cranny of Tomales Bay and will be able to show you all the prettiest spots on these incredible guided kayaking tours. If wildlife is one of your main interests, these tours will also give you a great chance of spotting all sorts of animals including harbor seals, water birds, leopard sharks, starfish, otters, and more. Some of the tours also include a little stop-off on a private beach for the group to rest up and enjoy some snacks in an incredible picturesque location.